Ordering bikes online is becoming more and more popular due to there not being any shop keeping or warehouse costs, making the prices better. And don’t worry about the old wisdom of trying a bike before getting it, that is quite definitely overrated. And very highly. Salesmen say this just as a means to get you to invest in a bike. It really doesn’t have to do that much with finding the right size for yourself. Another reason is that salesmen know that there are decent bikes on the online market and the option of getting to sit on one gives them an apparent edge over that market, but in actuality, it isn’t by any means necessary to choose a bike with the right size. There are many good methods to choose a good bike. I’m gonna highlight THREE SEVEN METHODS if you don´t know how to measure a bike. Feeling more confident? Good. 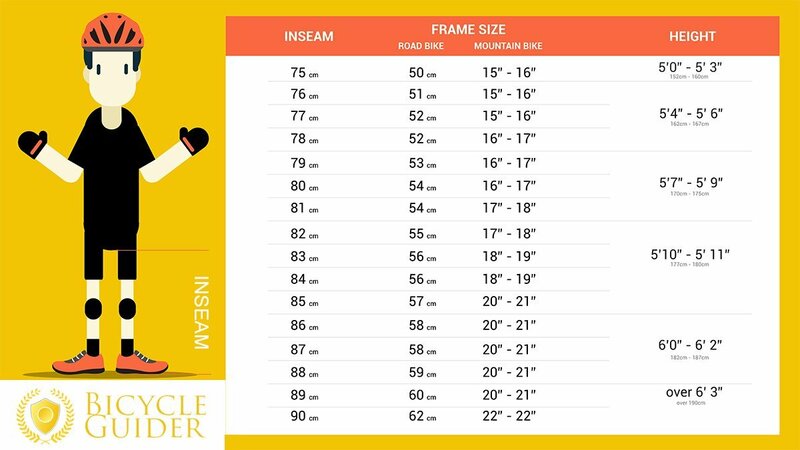 There are actually three different ways to pick a size: you can calculate it or use the bike size charts below. Let´s start with the easiest. The bike size is measured from where the seat post starts down to the crank. You can also use the bike height chart. What mountain bike frame size do I need? Need Professional Fitting Service? Order From Amazon! Take off your shoes and stand with your legs 15-20 cm (6” – 8”) apart. Measure the height from the ground up to where your legs come together. Be sure about the bicycle type you want to choose: Mountain bike, city bike or road bike. You can read about the different bike types here. Right saddle height has a very important role. If it´s too low, you won’t have enough power in your feet.In mountain bike racing, I have experienced that when the saddle falls one inch down from its normal position, I lose about 25-50% of my force. Stopping to fix it can cost me my position and about 15 seconds too, but then with the correct saddle height it’s not that hard to catch up with the group and even can get all the way to the next group ahead. So the right saddle height plays huge role! Push your leg down to the lowest point keeping it parallel to the ground. 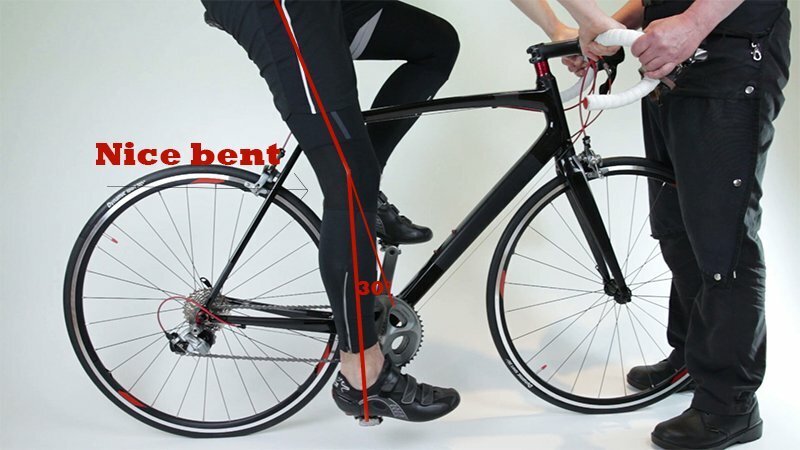 Move your saddle up or down until you have small bend behind your knee. It should be something around 30° but don’t worry too much about finding that exact angle. 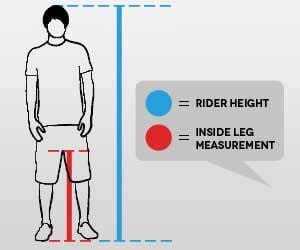 When you have found the right height for yourself, you can use a marker or a sharp object to mark the right position for your saddle as some of them can sink down a bit with time. 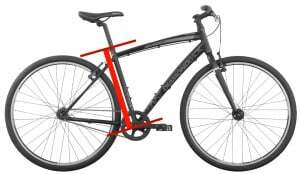 Some bikes also come with height lines written on the post, that you can check and remember once you’ve found the right one for yourself. 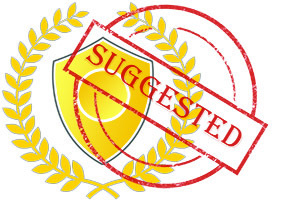 Fifth Sizing Calculator: Competitive Cyclist Fit Calculator. 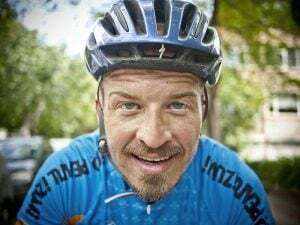 Extra – Professional Bike Fitting Service – Order From Amazon! If I Got My Bike Size Wrong? Give it time to get the feeling right. I remember when I got my first 29er mountain bike. It felt like a ship and seemed difficult to ride it in narrow trails or the forest. 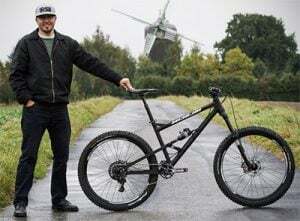 But I’ve become so familiar with it and can ride with full ease and skill, that when I sit on a 26″ mountain bike it seems so completely ridiculous how tiny it is. P.S. If you find my guides useful, please share my page below. This keeps me motivated to keep the information on this site up to date and accurate. Very inciteful…tremendous guide for me as a novice,looking to buy my 1st Mtn bike.A lot of teaching,helpful information.Glad I found this site and it helped me become very knowledgeable in deciding what suits my needs.